Although no Fluxus Indian Twirling Sticks are known to have survived, we do know a lot about how they were made and how they were used. Fluxus Indians used "twirling sticks" to explore various aspects of their mental life--including color perception, symbolic meaning, and transcendental consciousness. 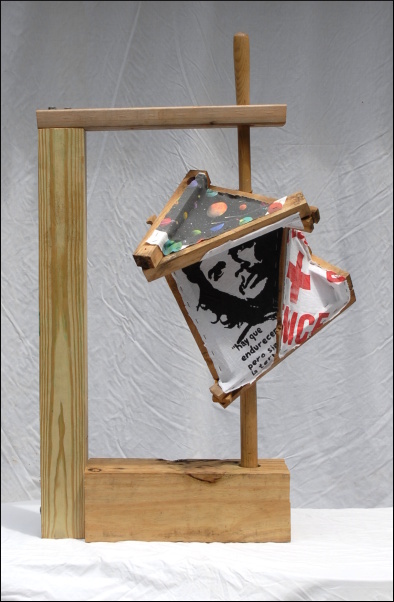 At least one account claims that the Fluxus Indians stumbled upon the the use of a twirling stick to study color perception and color mixing while spinning sticks with various colored pieces of cloth. They noticed that the "blended" color created when twirling these sticks varied as surface areas, arrangements, and colors varied. The Fluxus Indians who lived in what is now northern Minnesota are said to have developed a great knowledge of color perception during long winter investigations with the twirling stick. 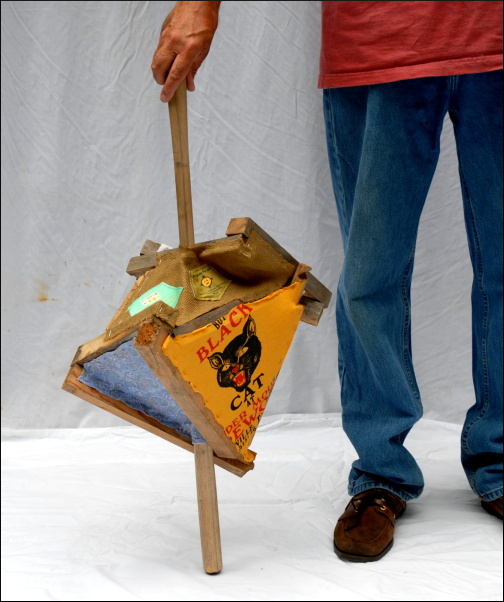 Other groups of Fluxus Indians adapted the Twirling Stick to explore the psychology of signs, symbols, and meaning. By revolving symbols and images, they sought to understand how the mind created meaning and associations. Different sizes, shapes and configurations of symbols and different spinning speeds yielded different effects--all fodder for further study. 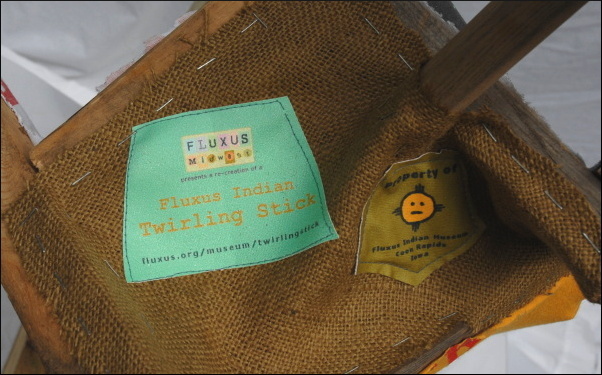 Symbolic Twirling Sticks were heavily used during the Fluxus Indians' New Year Brainstorming Festivals. Spinning various randomly selected symbols slowly in front of an observant crowd was a typical warm-up exercise used to get to new associations, new thoughts, and new ideas. 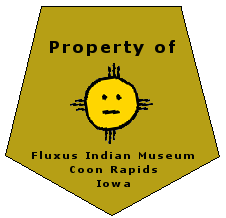 The Fluxus Indians developed several unique methods to explore and understand the mental life of images, thoughts, and ideas. One approach was the Twirling Stick. Another approach was the Mix-Up Game--a procedure to help unlock the hidden meaning and mystery of iconic symbols. The Twirling Stick was also used to induce hypnotic trance-like states. Staring at a Twirling Stick revolving at just the right speed, would allow a sitting observer to enter a transcendental state of "meaningful blankness." The Fluxus Indians discovered that each person had a unique optimal speed or rhythm at which the Twirling Stick would induce the trance. This "speed" was considered to be a personal "sacred rhythm." Inducing a trance by staring at revolving images while sitting in a fixed position led to the idea that trances might be achieved in reverse--by spinning oneself around in a stationary world. This worked and became known as Body Twirling. Fluxus Indian Body Twirling is remarkably simliar to and predates the meditative dance of the Whirling Dervishes--a mystical order of Sufi Islam that arose in 13th century Turkey. Some Fluxus Indians preferred the body-spinning method for inducing transcendental states because outside props--like twirling sticks-- were not required. Body Twirling could also be performed by many people at the same time and place and was believed to facilitate a sense of "shared ecstasy."